Brian Saario '58 (left) with Brian Meza '92, Prep Science Department head. "My Prep education gave me a strong sense of self and confidence that served me well throughout my career and life," states Bryan Saario, Prep class of 1958. Bryan entered Prep as a junior. His family had moved to Anchorage, Alaska when he entered high school. Bryan had always hoped to attend Seattle Prep. His uncle offered to have Bryan live with him in Seattle so he could attend Prep. He jumped at the opportunity. He clearly remembers his first day at Prep. He immediately felt at home. He valued the academic rigor of a Jesuit education and says, "My Prep education has shaped my thinking in so many ways." His love was always science. Bryan is an oral and maxillofacial surgeon. He practiced in Alaska before moving back to the Seattle area to retire. He has been passionate in helping victims of the Middle East conflict. Twice he has traveled to Palestine to volunteer his services to operate on children with cleft lip and cleft palate deformities, congenital malformations of the face and facial trauma patients, victims of the violence there. His trips have been made under the auspices of Palestine Children's Relief Fund and Washington State Physicians for Social Responsibility. From these experiences, he hopes to expand his activism through Pax Christi and Sabeel human rights efforts. When Bryan graduated from Prep, he said he had a strong desire to make a difference in the world. At the time, this may have seemed like a grandiose idea. Upon ref lection, Bryan says he feels that he has been able to contribute in some small measure and hopefully it has made a difference in the lives of people he has cared for in his past professional life. This fall, Bryan returned to campus and attended several science classes. He was quite impressed with our Science Department. 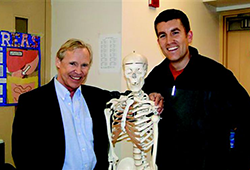 It was after this visit that Bryan made the decision to leave Prep in his estate plans by establishing a named endowment to support the Science Department. He sees his Prep bequest as an investment in the future. "It makes me feel good to do this" said Bryan. By remembering Prep in his will, his legacy will have a lasting impact on the future of our Prep students. Bryan continues to give back in a way that will make a difference for generations to come.